[Lambeth Palace] Church of England cricketers beat a Vatican team on Friday in a historic match in support of a joint initiative to wipe out modern slavery and human trafficking. 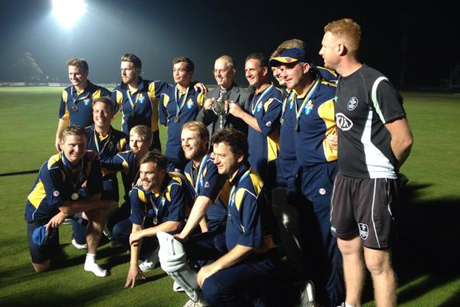 The Archbishop of Canterbury, Justin Welby, congratulated both sides and presented the trophy to winning captain Stephen Gray after the match, played in the shadow of Canterbury Cathedral at Kent County Cricket Ground. The match was organized to raise awareness and funds for the Global Freedom Network, a joint initiative between religious leaders including Pope Francis and the Archbishop of Canterbury which is committed to eliminating modern slavery and human trafficking across the world.